Hello, and welcome to the Derkins Library! Having read the articles collected here, I think it's safe to say that this site would make Bill Watterson rather uncomfortable. This level of scrutiny and study is exactly what he didn't like about the celebrity with which he found himself burdened. I can only offer him a sincere apology he will no doubt never read. Looking over these time and again, I've decided that a comic strip as rare as Calvin and Hobbes merits more study, and we can come to a better understanding of the strip by studying its creator as well. IN OTHER WORDS: These writings are collected here for research and just a bit of posterity. If I find out someone is using the information in them to bother Bill or his family, I will remove them. Thank you for your understanding. Enjoy! A short biography I wrote about Bill Watterson. A Short Q&A With Lee Salem: When the Complete Calvin and Hobbes book set was published in 2005, I e-mailed Universal Press editor Lee Salem with some questions. He worked with Bill Watterson throughout the strip's newspaper run and was kind enough to write back to me. The Cheapening Of Comics: A speech by Bill Watterson delivered at the Festival of Cartoon Art, Ohio State University, October 27, 1989. This speech was first printed in the summer-autumn '89 issue of the quarterly comics magazine WittyWorld, then it was reprinted in The Comics Journal's first "creators rights" issue (TCJ #137, September 1990). Commencement Speech: Bill gave the graduation commencement speech at Kenyon College in Gambier, OH (his alma mater) on May 20, 1990. The Cartoonist's License: Here's an early piece Bill wrote way back in 1982 for Target, a quarterly political cartooning journal. In it, he gives his rebuttal to an article by Bob Gorrell in the previous issue. Book reviews: Feiffer & Breathed: In issue number 12 (summer 1984) of the political cartooning journal Target, Watterson reviewed two books, Marriage is an Invasion of Privacy and Other Dangerous Views by Jules Feiffer, and 'Toons for the Times by Berke Breathed. Book review: Keefe-Kebab: In issue number 15 (spring 1985) of the political cartooning journal Target, Watterson reviewed the book Keefe-Kebab by Mike Keefe. Book review: The Great Communicator: In issue number 18 (winter 1985/86) of the political cartooning journal Target, Watterson reviewed the book The Great Communicator by Jim Borgman. Cartoonist PROfiles essay: In December 1985, issue number 68 of editor Jud Hurd's magazine "Cartoonist PROfiles" published a nice essay by Bill. In it, he discusses -- with tongue planted firmly in cheek -- how he got Calvin and Hobbes published and how he feels about syndicated cartooning in general. I was going to reproduce the essay here, but as of 2004 Mr. Hurd has published a fine collection of PROfiles articles entitled, "Cartoon Success Secrets." The Watterson essay is reprinted there and so I've linked to that in the interest of supporting the comics community. Fox Trot foreword by Bill: In August 1989, the first book collection of the comic strip Fox Trot was published. Bill not only wrote this foreword, he helped design the book's layout as well. Krazy Kat foreword by Bill: Bill wrote this essay for a book called The Komplete Kolor Krazy Kat Vol. One, published in 1990 by Eclipse International Books. Dear Editor: Here's the official letter to newspapers announcing Bill's imminent retirement, and the end of the comic strip. Also included is a picture of the letter the way it was printed in newspapers. Borgman introduction by Bill: This is the 1995 introduction from "Disturbing the Peace", a great collection of Jim Borgman's cartoons (mainly one-panel political cartoons). Your Career In the Comics: In 1995, Lee Nordling published this book discussing information for aspiring newspaper cartoonists. The book features commentary from many of the industry's leading artists and publishing authorities. Here are Bill Watterson's comments from various parts of the book. It's an interesting chance to see what he thinks about the early part of getting a comic strip published, and the day-to-day reality of comics creation. An Incredible Ride To the End: Bill Watterson has tended to speak his mind when going on the record publicly. To wit: Here is his 1997 appreciation of the classic comic strip Little Nemo in Slumberland. He spends as much time pointing out the strip's flaws as he does celebrating its merits. But as much as I love McCay's work, I can see Watterson's points. Drawn Into a Dark But Gentle World: In December of 1999 Bill wrote this respectful eulogy for the strip Peanuts. This item was featured in quite a few newspapers at the time. The Grief That Made 'Peanuts' Good: With little or no fanfare, Bill came out of self-imposed seclusion in 2007 to write this Wall Street Journal review of David Michaelis' book "Schulz and Peanuts". Thompson introduction by Bill: In 2008, Watterson wrote the introduction to a collection of the comic strip Cul de Sac. An Overnight Success After Five Years: Although not especially long, this interview/article in the Feb.8, 1986 Editor & Publisher is notable because it catches up with Bill early on in the strip's run, and it discusses the process by which C&H achieved newspaper syndication. An Interview With Bill Watterson: One of the few times Bill ever granted an interview. This one was conducted in 1987 by Andrew Christie for Honk Magazine, a comic art publication. C&H Creator Draws On the Simple Life: A nice piece from the LA Times' April 01, 1987 edition. Bill, just 28 at the time, agreed to be interviewed about his thoughts on the characters. Drawing the (Comic) Line: In this April 26, 1987 interview from the Houston Chronicle, Bill speaks at a time when his options were just beginning to blow wide open financially. He even discusses the licensing pressures that were just beginning to rear their ugly heads. On the Making of a Standout Comic: The Philadelphia Inquirer spoke with Watterson for this April 28, 1987 piece in which Watterson says he feels lucky, having struggled through the process of reaching publication and achieving both critical and reader acclaim. And shockingly, he sounds slightly positive about the idea of seeing Calvin animated. Watterson: Calvin's Other Alter Ago: This fascinating article comes from the Plain Dealer newspaper in Cleveland, Ohio, in their August 30, 1987 edition. Though I've seen this on other sites, most of them were filled with spelling errors and missing an entire page of text! Here's the full version. Interview: Bill Watterson: Here's the last known full-length interview with Bill, printed in the February 1989 issue of Comics Journal. It's a very interesting interview conducted by Richard Samuel West, editor of the political cartoon journal Target, which Watterson worked on in the early 1980s. Extra special thanks to Francis from Calvin et Hobbes Sur Altunis for typing this up! Bill Watterson, creator of beloved 'Calvin and Hobbes' comic strip looks back with no regrets: This February 2010 interview is a bit short and to my mind, something of a wasted opportunity, since it repeatedly asks about how Watterson sees his place in comics history, which he has already addressed and doesn't seem to care about. But hey, any time Bill speaks publicly is exciting. Cul de Sac - Interview by Bill Watterson: This wonderful discussion comes from the 2013 book "The Art of Richard Thompson" and it features Bill sitting down with his friend Richard (author of the comic strip "Cul de Sac") to discuss their careers in art and much more. Ohio State University exhibit interview: In March 2014, the Billy Ireland Cartoon Library & Museum at Ohio State University held a dual exhibition for the work of Bill Watterson and Richard Thompson. For the occasion, Bill answered some questions from museum curator Jenny Robb. A Surprising Win For Bill Watterson: An article from the May 30, 1987 Editor & Publisher which discusses Watterson's first Reuben award. Calvin Tops Comics Poll: Pretty self-explanatory. The Houston Chronicle held a poll about people's favorite comic strips and this article lists the results. The article date is January 31, 1988. Watterson Knocks the Shrinking of Comics: This article about Bill's speech at a Walt Kelly celebration at Ohio State University is from Editor & Publisher's December 3, 1988 issue. It precedes Watterson's "The Cheapening of Comics" speech (see above). The Winner and New Champion: A December 04, 1988 article from the St. Louis Post-Dispatch about Calvin and Hobbes winning their annual readers' poll. Features comments from Watterson's then-editor, Jake Morrissey. Oh You Kid - A Strip of Leviathan Quality: Here's an appreciation of the then-current strip Calvin and Hobbes, written by noted comics historian Richard Marschall. It was published in issue 127 of Comics Journal in February 1989. Errors & Misconceptions: In issue 130 (July 1989) of the Comics Journal, Watterson friend and former collaborator Richard Samuel West wrote a letter correcting a few points from the articles in issue 127. It's quite interesting despite its short length. C&H Creator Wins Again: A short piece regarding Bill Watterson's second Reuben win, from the May 27, 1989 issue of Editor & Publisher. Watterson and Walker Differ on Comics: This is an excellent article from the November 4, 1989 edition of Editor & Publisher about Ohio State University's 1989 Festival of Cartoon Art, during which Watterson delivered his speech, "The Cheapening Of Comics". Bill's First Sabbatical: A little announcement from the Washington Post from March 28, 1991 about Bill's first sabbatical, a 9-month stint beginning in May of that year. Nine-month Vacation for Bill Watterson: From Editor & Publisher's March 30, 1991 issue. Newspaper editors and cartoonists discuss their thoughts on Bill's first sabbatical. They Oppose Full Price For Comic Repeats: This article from Editor & Publisher's October 12, 1991 issue is about editors' thoughts on cartoonists taking vacations and sabbaticals. Not coincidentally, this was right in the midst of Bill's first sabbatical. Size Requirement for C&H: This article is from Editor & Publisher's Dec.21, 1991 issue. With Bill's return from his first sabbatical, came the news that his strip would have to be printed at half-page size in newspapers. This piece features Bill's comments about the new situation. More Reponse To Half-Page 'Calvin Strip': From the January 11, 1992 edition of the trade magazine Editor & Publisher, here's an article about the American Association of Sunday and Feature Editors (AASFE) and their response to the post-sabbatical half-page size requirement for C&H on Sundays. The Latest on Calvin and Hobbes: An article from Editor & Publisher's February 1, 1992 edition, with more discussion of the new size requirement for the Sunday strip. Watterson Returns, Demands His Space: Even more discussion on the new Sunday size requirement in this Comics Journal piece from issue 148 in February 1992. Most notable for me were the comments from syndicate president John McMeel, which I hadn't seen elsewhere. Cartoonists Discuss 'Calvin' Requirement: In this interesting article from the March 7, 1992 issue of Editor & Publisher, cartoonists give their opinions of Watterson's new requirement. I'm known for my tolerance of other people's viewpoints, but I must admit that Bil Keane's comments in this one really boiled my blood. See for yourself. Commodious circulation: Commodity and dream in Joyce's `Ulysses': This is an excerpt from a very dense, much longer article in the summer/fall 1993 issue of the very scholarly journal James Joyce Quarterly. The Annotated Calvin and Hobbes: On January 9, 1994, this humorous piece appeared in the Sunday NY Times magazine. It's a "scholarly" look at Calvin's classroom learning style. Calvin and Hobbes and John Paul: This is an introduction to a longer, unrelated article in the February 1994 issue of Current, which "selects responsible articles published in recent months on topics of longstanding concern to the American public." Bill's Second Sabbatical: In early 1994 it was announced that Bill would be taking the rest of the year off. Here's the announcement in the March 19, 1994 edition of the trade publication Editor & Publisher. 'Calvin' Plays Hooky: For those completists among you, here's the announcement for the 2nd break, the way most people (non-industry folks) saw it, reprinted here from the March 21, 1994 edition of the Washington Post. Mixed Response To Second Sabbatical: In this article from the March 26, 1994 issue of Editor & Publisher, we get some interesting quotes from industry insiders about their views of Watterson's second sabbatical. "C'mon, It's Just Snow": In the April 1995 issue of ARTNews magazine, this little article appeared, pointing out Calvin's recent discussion of art and snowmen. Bill's Retirement Announcement: A November 9, 1995 piece from the AP (Associated Press), announcing that Bill was ending the strip. 'Twas a sad day indeed. Saying Goodbye: The next day, November 10, 1995, this article appeared in the Baltimore Sun. It features some funny and touching words from community members. No Calvin and Hobbes? : Yet another announcement about the strip ending, this time from the college newspaper Yale Daily News. Strong Reaction To End of Comic Strip: From Editor & Publisher's Nov.18, 1995 edition, here's an industry look at the retirement announcement, with Bil "Family Circus" Keane offering some of the most inane, narrow-minded comments I've ever had the displeasure of reading. So Long, Kid: An Obituary...: A very nice, melancholy look back at C&H, written just before the strip ended. From The Washington Post, dated November 19, 1995. Calvin and Hobbes To End: This article about the demise of Waterson's famous strip comes from the December 30, 1995 edition of the San Francisco Chronicle and it features some good quotes while offering up a staggering dollar amount that Bill gave up by not licensing his characters. Sober Conclusions: This piece from the January 8, 1996 U.S. News & World Report is extremely short, but I just had to include it here, because it's so odd. 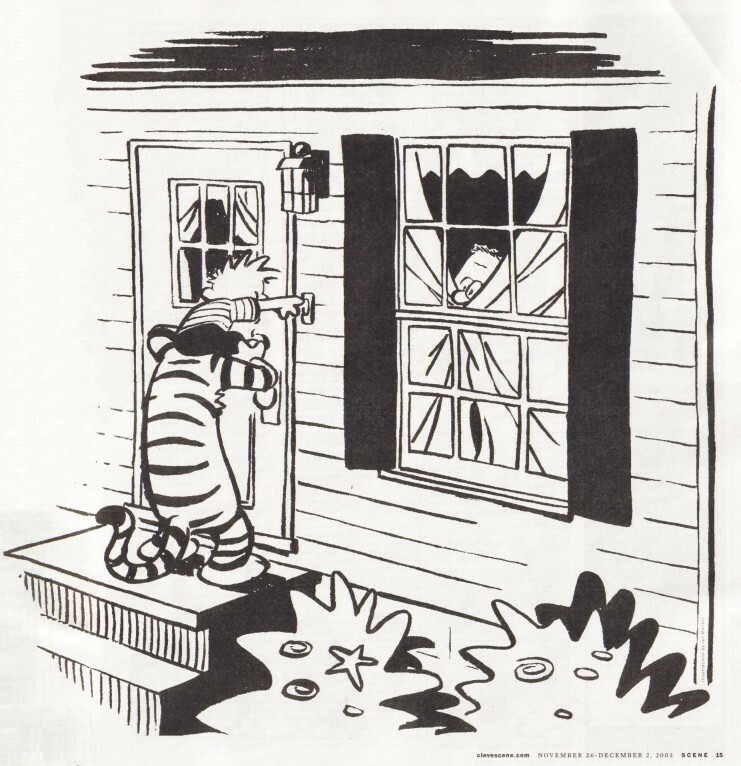 Calvin withdrawals shake Chico State: On September 04, 1996, this humorously vehement essay appeared in California State University's The Orion. The bit towards the end about Watterson becoming more like J.D. Salinger seems sadly prescient now. The Truth About C&H and Daily Republican Editors: I think it's safe to say that I don't "get" this piece from internet 'zine The Daily Republican, dated December 10, 1996. Awkwardly worded, this essay never quite decides if it wants to be humorous or not. I had to correct about a thousand spelling errors and grammatical mistakes too...but hey, enjoy! Calvin, Hobbes and Schrödinger's Cat: Here's a 1997 article from a Spanish periodical called Ciencia Hoy. It discusses the possibilities of whether Hobbes actually exists or not. Some of the original Spanish was a bit rough, but I think the translation's very close thanks to the hard work of Carol Proust and my friend Robin. The Gospel According To 'Calvin & Hobbes': From the March 15, 1997 edition of The Washington Post, this is an article about a minister preaching the New Testament using examples from C&H strips. Calvin's Unauthorized Leak: From July 17, 1997, here's an interesting Washington Post article I found that discusses the origins of the repulsive "Peeing Calvin" stickers seen on cars. Talent Rejects Often Caused Major Regrets: Though this March 05, 2000 article is short and only mentions Watterson once, that mention does provide us with an interesting bit of trivia to add to his biography. 'Peeing Calvin' Decals Now Recognized As Vital Channel of National Discourse: This humorous article comes from the April 5, 2000 edition of the satirical newspaper The Onion. Whatever Happened To...? : An article from the Christian Science Monitor dated December 28, 2000. It's an update on Bill's life at that time, with some interesting quotes from people acquainted with him. The Calvin / 'Fight Club' Connection: Around 2001 this article started popping up in various places around the internet. It's an essay by Galvin P. Chow arguing that the characters in the film / book 'Fight Club' are really grownup versions of the Calvin characters. Read it and come to your own conclusions. Mystery Man: This May 2002 article comes to us from the publication Comic Book Marketplace. In it, the author explores Mr. Watterson's choice of living privately, having a bit of fun with the idea, and describes a trip to the syndicate's offices. Jail Bill Watterson: This humorous essay comes from the April 9, 2004 edition of MIT's school newspaper The Tech. 'Calvin and Hobbes' Returning to Newspapers -- Sort Of: In this May 2005 article from Editor & Publisher, some details of the Complete Calvin and Hobbes book set are discussed as well as the contest to send in questions for Watterson to answer in the fall of 2005. Watterson Loans 3,000 Original Calvin & Hobbes to Ohio State University: In June 2005, Universal Press issued this press release. I guess it speaks for itself! 'Calvin and Hobbes' Creator Finally 'Speaks' -- in Book Intro: This piece from Editor & Publisher delves into Bill Watterson's lengthy intro to the 'Complete Calvin and Hobbes' book set in late 2005. 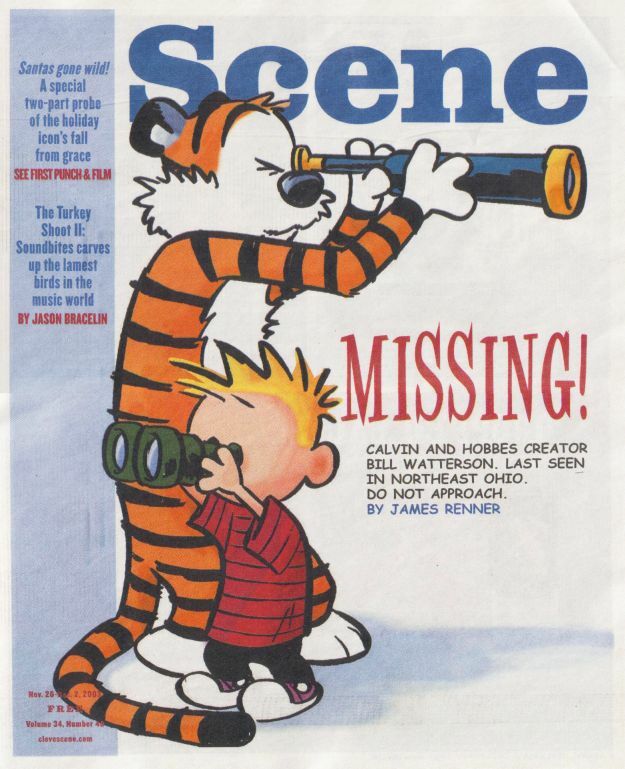 The Tiger Strikes Again: This nostalgic article from the October 4, 2005 edition of the Washington Post is partly about the 'Complete Calvin and Hobbes' book set, and partly a look back at the strip itself. I found the Spielberg bit quite interesting. Calvin and Hobbes Creator Keeps Privacy: Bill's parents speak about their son in this interesting Associated Press article from October 22, 2005. A Boy His Tiger and Their World: This November 18, 2005 article comes from Toronto's National Post and mentions me and this site. I'd like to thank Vanessa Farquharson for calling me for the article. Dartmouth College Winter Carnival: In February 2006, the annual Winter Carnival was held at Dartmouth College in Hanover, New Hampshire, USA. It was decided that the theme for their snow sculpture would be Calvin and Hobbes combined with the winter Olympics. Here are the pertinent articles from the school newspaper The Dartmouth.